Hello and welcome to my blog. 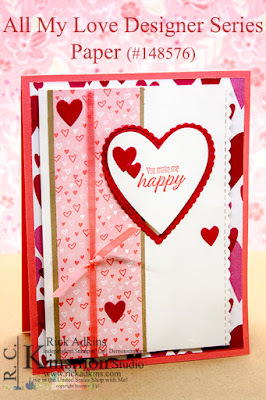 Today, I am going to share with you a card showcasing the All my Love Designer Series Paper; which is in the 2019 Stampin' Up! Occasions Catalog or as some refer to as the Spring/Summer Catalog. 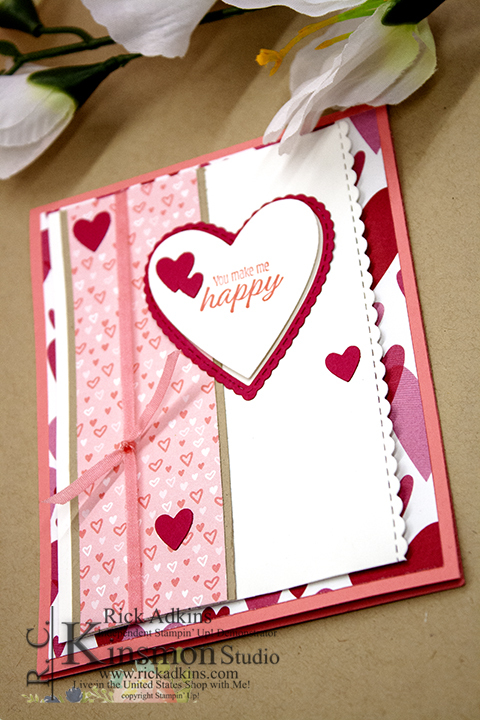 This beautiful designer series paper can be used for so much more than just Valentine's Day! With its classic color combinations and the hearts and floral patterns you could use it for any romantic occasion or event. 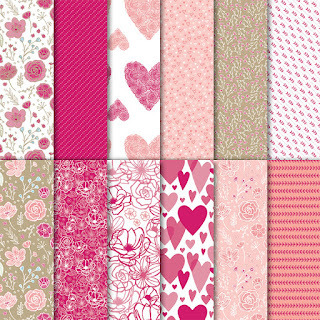 Here's a look at all the patterns in this wonderfully romantic pack. So you can see what all the wonderful imagery how you could create projects not just for Valentine's Day but for any love filled day of the year. I just love the mix of floral patterns and the hearts. Not even to mention that some of the hearts have flowers in them. 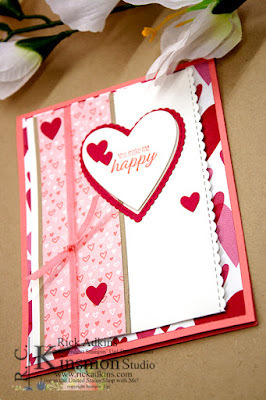 I can see this pack being used for Valentines, Spring Weddings, Anniversaries, Birthdays, and so much more. I know I said that before but I felt like it needed a little more attention. Because I don't want you looking over this pack of romantically colored designer series paper and it be gone and you start saying I wished I would have gotten that pack. If you don't get it before it's gone its your own fault. I am just going to tell you I told you to get it before it was to late. I spent a whole week showcasing it, telling you great and wonderful it was and told you to pick it up in my online store. I am sorry if you missed it but I told you so. That will be my response so just know that that's what will be said if you message me and say I wished I had gotten it. I am just saying. This is probably one of my favorite cards using this pack of designer series paper. You may be asking yourself why? Well, it showcases as much of the designer series paper as I possibly could. The third layer, which is made of whisper white cardstock and features the most wonderful stitched scalloped edge is 3 9/16 x 5 (after it was cut using the edgelet). I started out with a piece that was 3 3/4 x 5.
and the last layer of DSP was cut at 1 9/16 x 5. The Whisper white & lovely lipstick hearts where all cut from scrap pieces of cardstock. Use what you have up before you cut into that new piece of cardstock; right! Okay I don't know what's up with the 16ths today I am just going to go ahead and apologize now. Sorry everyone! So that's my card for today, I hope that you like it and that you don't forget to get a pack of this wonderful designer series paper before its gone. If you don't you know what I am going to say right. Thanks for joining me! You can pick up all these supplies in my online store 24/7 by clicking on the image in the product list below or by clicking on the shop now tab above. I will see you later my stampin friends. Gorgeous card! I too love this DSP! !